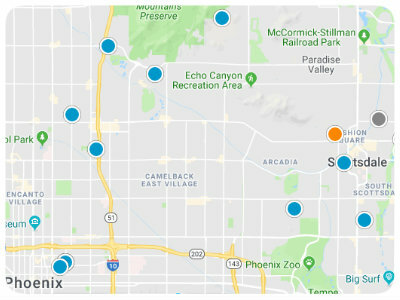 Roughly bounded by 44th to 68th Streets and Thomas Road to Camelback Mountain, is the swanky Phoenix neighborhood of Arcadia. Arcadia is home to mini-citrus orchards, breathtaking views of Camelback Mountain and acres of soft green grass. This upscale suburban community is quiet and also home to sprawling ranch homes, contemporary custom estates and everything in between. Homes for sale in Arcadia tend to be well-maintained and perched upon large lots with high property values. Arcadia is adjacent to the equally prestigious suburbs of Paradise Valley and the Biltmore area. Known for its well-irrigated, mature landscapes, Arcadia was developed on former citrus groves. Throughout the community you’ll find yards boasting lemon, orange and grapefruit trees reminding residents of the community’s past. Homes for sale in Arcadia vary in price depending upon the property’s size, age, style, location and special features. Residents of Arcadia are surrounded, not only by abundant natural beauty, but by excellent opportunities for shopping and dining. The area is also known for impressive entertainment and recreation options, as well as having multiple cultural and historical points of interest. If you would like to buy a home in Arcadia of Phoenix, Arizona, please do not hesitate to contact us today for more information. Amazing lot surrounded by beautiful homes and mature landscaping ready to build your dream home. Location, Location, Location.